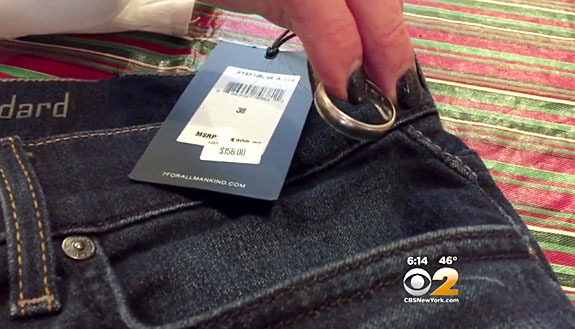 Staten Island, N.Y., resident Jean Vlahopouliotis says she's on a mission to locate the rightful owner of a man's wedding band found in the pocket of a pair of jeans she ordered online from NeimanMarcus.com. On Tuesday of last week, Vlahopouliotis' husband was trying on his late-arriving Christmas gift — a brand new pair of "7 For All Mankind" jeans, size 38 — when he he felt something unusual in one of the front pockets. “He reached into the left front pocket and pulled out this man’s wedding band,” Vlahopouliotis told CBS New York. At first, Vlahopouliotis thought her husband, Chris, was joking and that the ring was actually his own wedding band that he misplaced two years ago. "[I thought] he had found it randomly in the house somewhere and that he was just was teasing me,” Vlahopouliotis said. But a quick inspection of the ring confirmed that it wasn't her husband's ring at all. The classic comfort-fit white gold band with a domed profile and milgrain edge was manufactured by Benchmark and contained an important clue — a wedding date inscribed on the inside of the band. A supervisor for Neiman Marcus was able to tell Vlahopouliotis that her husband's jeans had been shipped from a store in Tyson’s Galleria Mall in McLean, Va., and that the pants were never returned or shipped anywhere else. Vlahopouliotis guessed that the mystery ring might belong to a store employee or could have slipped off the finger of someone who had previously tried on the pants in-store, before they shipped out. She also surmised how the ring may have slipped off a finger and gotten into the pocket. "The pockets are kind of tight," she told SILive.com. "If the ring was the slightest bit loose that could definitely be a possibility." Vlahopouliotis and her husband can empathize with the gentleman who lost his ring. 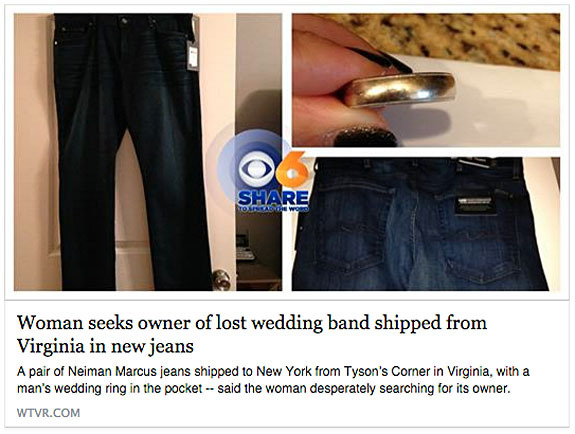 Because she's fairly certain the ring came from the Virginia area, she has shared her story with the Facebook pages of news stations near McLean. If the owner can confirm the ring's inscription, she will return it right away. Vlahopouliotis continues to have confidence that the power of social media will reunite the ring with its owner. If successful, she promised to take her husband to Atlantic City and, yes, he will be wearing his lucky jeans. Credits: Jean Vlahopouliotis; Screen captures via newyork.cbslocal.com, Facebook/cbs6wtvr. 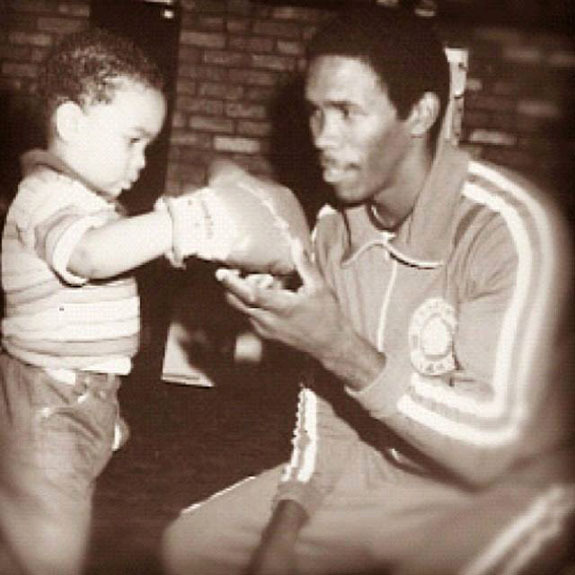 Olympic boxing champion Howard Davis Jr., who won the gold medal and was named the most outstanding fighter in the Montreal Games, died of cancer last Wednesday. He was 59. Famous for his stellar amateur boxing career, which featured wins over future world champs Tommy Hearns and Aaron Pryor, Davis compiled an astounding 125-5 record. But the highlight of his career was winning the gold in the lightweight division at the 1976 Summer Games. He dedicated the medal to his beloved mother, Catherine, who passed away just three days before the opening ceremonies. "It was devastating," Davis told the New York Post in August. "But I remembered her pointing her finger in my face and telling me, `You'd better win the gold medal.' I wasn't going to be denied. There was no way I was going to lose." Davis' hard-earned gold medal had been in his possession for only five years when a skittish burglar — with an eye for jewelry and gold — set in motion a bizarre series of events. 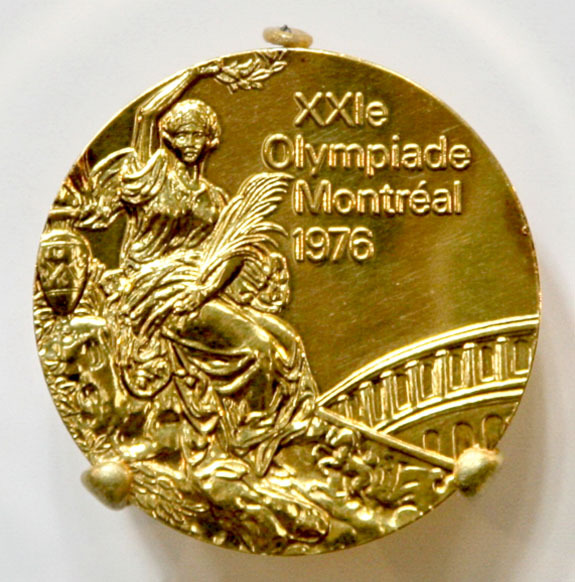 According to Olympic historian David Wallechinsky, the medal along with jewelry valued at $15,000 were stolen from Davis' Dix Hills, N.Y., home on Long Island in 1981. The robber apparently panicked while fleeing on the Long Island Expressway and tossed the medal from his car. Fortunately, the medal ended up on the grassy median and not on the pavement. Ten years later, the Olympic treasure — which features a design by Florentine artist Giuseppe Cassioli and is clad in six grams of pure gold — was found on the side of the busy eight-lane roadway during a beautification project by a highway landscaper name Jake Fiesel. Failing to understand the significance of his new possession, Fiesel used the 60mm wide Olympic medal as a paperweight for four years. In 1995, a visitor to Fiesel's home pointed out that what he had was an authentic Olympic medal. The engraving at the bottom of the medal revealed that it was awarded for boxing. Fiesel was able to connect the dots and arranged to reunite the Long Island boxer with this hard-fought medal — the one dedicated to his mother's memory — 14 years after it was taken from his home. It's been a part of Davis' prized possessions ever since. The soft-spoken boxer, who never drank alcohol or smoked cigarettes, was diagnosed with stage 4 lung cancer in February of 2014. In an interview with Ringsiderreport.com, Davis vowed to beat it. Sadly, his battle ended last week, but the memory of his Olympic triumphs and his gold medal will continue to live on. A public memorial service will be held in Fort Lauderdale on Thursday. Medal photo by Cliff via Wikimedia Commons. Howard Davis photos via Facebook/HowardDavis. The internet is buzzing about the discovery of the world's largest blue star sapphire — a palm-sized gemstone that its owner claims to be worth at least $100 million and could sell for up to $175 million at auction. We're not so sure, as we will explain later. Mined in the Sri Lankan city of Ratnapura and weighing 1,404.49 carats, the sapphire displays a mottled medium blue color and a distinctive six-point asterism at its center. 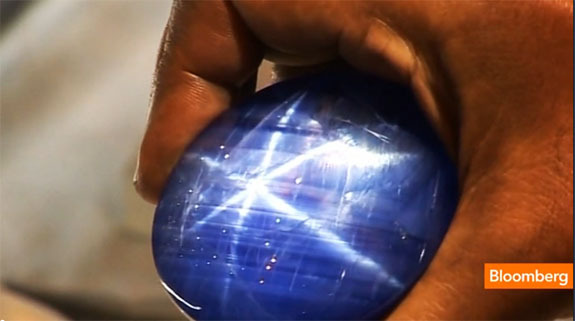 "When the stone was brought to me I suspected that it might be the world's largest blue star sapphire," the anonymous gem dealer told the BBC. "So I took a risk and bought it." He named the sapphire the The Star of Adam to honor the Muslim belief that Adam arrived in Sri Lanka after being sent away from the Garden of Eden. But while the BBC, CNN and other leading news outlets are reporting the gem's value at $100 million or more, we're wondering how the anonymous owner came up with the valuation. If the gem eventually sells for that amount, it will be more than double what was spent on the current record holder — a 12.03-carat fancy blue diamond called “The Blue Moon of Josephine.” That stone sold for $48.5 million at Sotheby’s Geneva in November of 2015. The Star of Adam weighs 1,404.49 carats and eclipsed the former blue star sapphire record holder by only 9.49 carats. 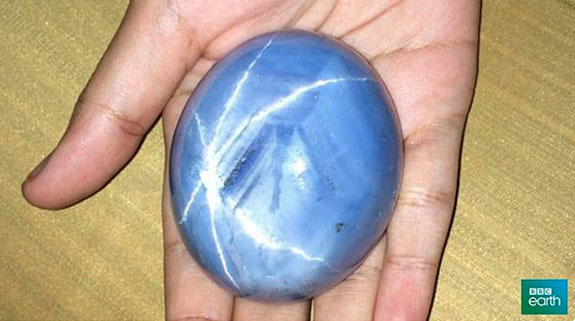 The other stone, which was also of Sri Lankan origin and presents what we believe is a richer blue color, was the subject of a Bloomberg report back in December of 2012. At the time, it carried a price tag of $2.85 million — a far cry from The Star of Adam's purported value. Another star sapphire was the center of controversy back in the 1980s. Students of gemology have heard the tale of the Roy Whetstine Star Sapphire that weighed 1,905 carats and was billed as the largest star sapphire in the world. The Texas gem broker purchased it at the Tucson Gem Shows in 1986 for a mere $10 because the seller believed it was a lavender agate. The gem was later confirmed to be a star sapphire and was appraised for $2.28 million. According to Snopes.com, Whetstine and his gemstone became overnight celebrities. Their story was featured in People magazine, The New York Times, and on The Late Show Starring Joan Rivers. When Whetstine returned to Tucson a year later to sell what he named "The Life and Pride of America," there weren't any takers. Some critics at the show muttered that the "muddy grey" stone was hardly worthy of being a paperweight. After inspecting Whetstine's sapphire, John Sampson White, the curator of the National Gem and Mineral Collection at the Smithsonian Institution, told The New York Times that although the stone was technically a sapphire, it had an unattractive color and was hardly of gem quality. He called the gem an "insignificant stone" and estimated the value at only a few hundred dollars. The bottom line is that the value of The Star of Adam will be based on what a buyer is willing to pay. Stay tuned to this space as we monitor what is certain to be an interesting saga. Bakers from Paris to Brooklyn are kicking off the new year with blinged-out delicacies designed to delight and excite jewelry lovers. In Paris, the husband and wife team of Julie and Nicolas Lelut baked diamonds into the almond cream filling of a huge batch of holiday galettes, a buttery flaky pastry. Eight hundred galettes were distributed equally between their two stores — with one diamond hidden in a pastry at each location. 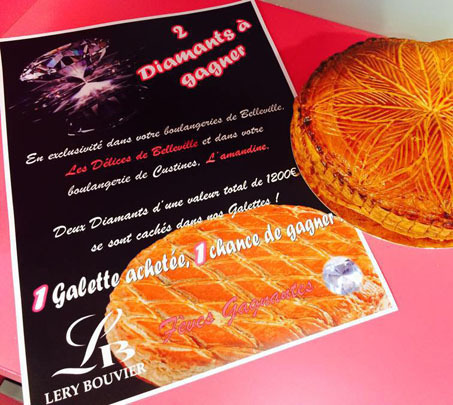 Visitors to the Délices de Belleville bakery in Paris earned a 1-in-400 chance of winning a .20-carat white diamond, while visitors to their L’Amandine location in Custines had an equal chance of winning a .20-carat blue diamond. Both diamonds were valued at 600 euros (approximately $650), according to odditycentral.com. The bakers held the one-day treasure hunt promotion yesterday to coincide with The Epiphany, a Christian festival held on January 6 in honor of the coming of the three kings to the infant Jesus Christ. To prevent the lucky winners from accidentally swallowing their diamonds, the bakers used oversized replicas that could be exchanged for the real diamonds, which were certified as authentic by a local jeweler. The promotion was the brainchild of Julie, who believed that offering diamonds was the perfect way to attract female customers to the couple's new Paris location. Exactly 3,623 miles away in Williamsburg, Brooklyn, Bjorn DelaCruz, the founder of the recently-opened Filipino restaurant called the Manila Social Club, is promoting a luxurious $100 “Golden Doughnut,” which is filled with ube (a purple yam jam), covered in icing made with Cristal champagne and dusted with edible 24-karat gold flakes. “I take pride in this, and to me it’s a piece of art,” he told firstwefeast.com. If you buy a dozen for a mere $1,000, the restaurant will deliver the gilded treats anywhere in the New York Tri-State area. DelaCruz said that the golden donut was conceived during the holiday season, and was popular enough to make them a regular offering. The special donuts must be ordered 24 hours in advance. 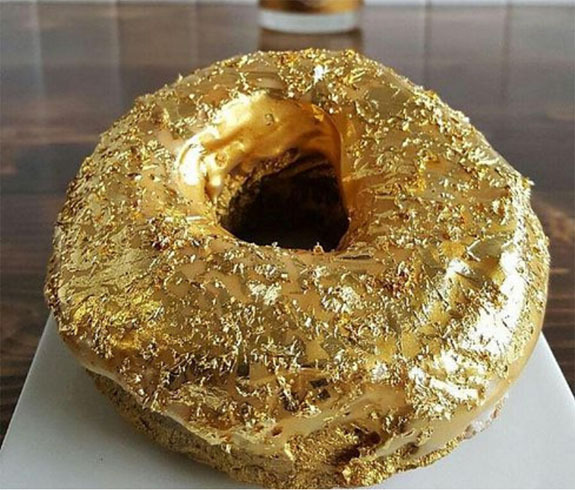 Regular readers of our blog may remember a story from April of 2015 about a Canadian shop that promoted the $100 "Donutopia," a deluxe treat decadently decorated with 24-karat edible gold and faceted sugar “diamonds.” The blinged-out “Donutopia” donut came with a Certificate of Authenticity. Credits: Les Delices de Belleville/Facebook; Instagram.com/manilasocialclub. Welcome to a special edition of Music Friday, when we bring you memorable songs with jewelry, gemstones or precious metals in the title or lyrics. Today we bend the rules a bit to pay tribute to the incomparable Natalie Cole, who passed away last week at the age of 65. Anybody who has attended a wedding over the past 40 years has surely danced to one of Cole's romantic hits, starting with 1975's "This Will Be (An Everlasting Love)," and continuing with "Inseparable" and "Unforgettable." Wedding DJs love "This Will Be" because the song is ideal for the wedding entrance, cake cutting or bridal party introductions. The song was famously used during the final credits of The Parent Trap (1998), and is prominently featured in the current series of eHarmony commercials. This is what Cole had to say about her everlasting love: "You brought a lot of a sunshine in to my life / You filled me with happiness I never knew / You gave me more joy then I ever dreamed of / And no one, no one can take the place of you." Written by Chuck Jackson and Marvin Yancy, "This Will Be" was Cole's debut single and one of her biggest hits, earning her a Grammy Award for the Best Female R&B Vocal Performance. The song also helped secure her Grammy Award for Best New Artist. "This Will Be" reached #6 on the U.S. Billboard Hot 100 list and #1 on the U.S. Billboard Hot Soul Singles list. Later, the song's three-word title would be appended with "(An Everlasting Love)." Cole, the daughter of famous crooner Nat King Cole, was born in Los Angeles in 1950. At the age of 6, Natalie sang on her father's Christmas album and later began performing at age 11. Cole was only 15 years old when her dad passed away in 1965 at the age of 45. In 1991, Cole recorded a duet of "Unforgettable" with her dad by mixing her track with the original he recorded in 1951. The result was so successful that it won three Grammy Awards, including Song of the Year. "This Will Be (An Everlasting Love)"
Written by Chuck Jackson and Marvin Yancy. Performed by Natalie Cole. This will be the first time anyone has loved me. And made me believe you've got more thrills to spare, oh! Oh, yes it will now! 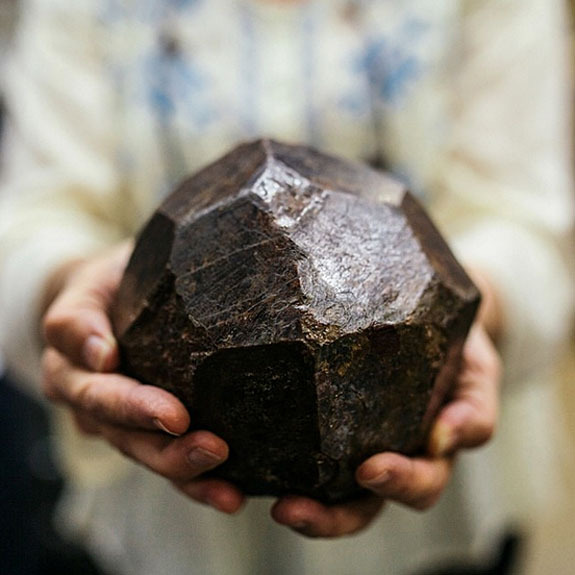 Once the pride of Manhattan, the "Subway Garnet" — a 9 pound 10 ounce reddish-brown crystal of the almandine variety — is currently relegated to a storage drawer on the fourth floor of the American Museum of Natural History. To add insult to injury, there's mounting evidence that it shouldn't have been called the Subway Garnet at all. In a recent article in The New York Times, George Harlow, the curator for the earth sciences department at the museum, explained why the Subway Garnet has been out of the public eye. He said that only 2 percent of the vast collection is on view, so any visiting geologist who wants to see what may be the most famous example of January's birthstone must make an appointment with the Department of Earth and Planetary Sciences. The Museum's mineral and gem collections total in excess of 100,000 specimens. While it had been a museum headliner starting in the late 1960s, today the seven-inch-wide stone is nearly forgotten. And what about the name? Legend states that the Subway Garnet was discovered by a city worker in 1885 near the corner of 35 Street and Madison Avenue in New York City during the excavation for the New York City subway system. Early accounts of the garnet's discovery and the timeline of the New York City subway system seem to contradict two key "facts" about the gem. First, the New York City subway official broke ground in 1900, 15 years after the discovery of the Subway Garnet. It was very unlikely it was found during a subway-related excavation. It was much more likely that it was found during a sewer excavation. Perhaps, the name "Sewer Garnet" didn't carry the right ambience for the rare gem, which boasts 24 natural facets. 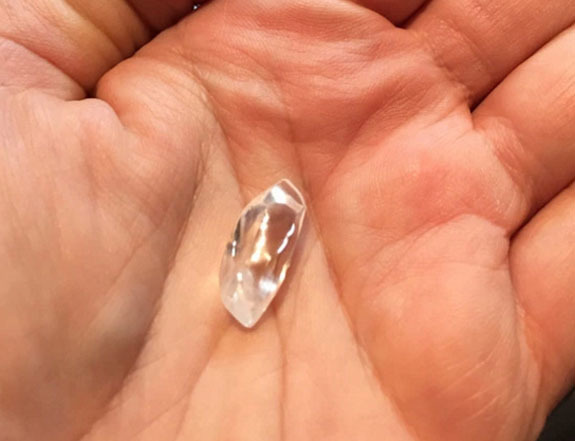 The New York Times recently reported that the massive crystal was, in fact, found eight feet underground during a sewer excavation in August of 1885. William Niven, the owner of a business that sold gemstones and minerals, claimed that he picked up the garnet as he was passing by the site, just after an unnamed laborer dumped it on the street during the excavation. Dr. Niven then sold it for $100 to mineralogist George F. Kunz. Also, early reports of the garnet's discovery seem to point to a different location of origin on 35th Street. 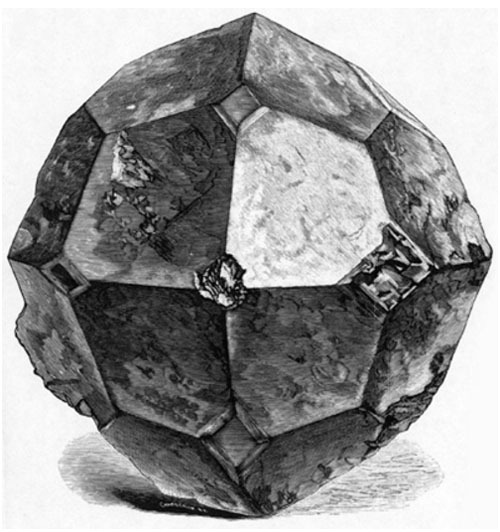 Mineral expert John Betts discovered documentation from an 1885 meeting by the New York Academy of Sciences that reported on "a large almandine garnet, seven inches in diameter, and nine and one-half pounds weight, found during the past week in an excavation on 35th street, between Broadway and Seventh avenue." The gem eventually made its way to the New York Mineralogical Club and then, in 1968, to the American Museum of Natural History in New York City, where it was displayed proudly at the entrance to Mineral Hall. Sadly, the excitement faded and the Subway Garnet was demoted to a storage drawer out of the public's view. There is still hope that the Subway Garnet will see the light of day and regain its old luster, according to Harlow. “Nothing’s been finalized, but I believe plans are afoot,” Harlow told The New York Times. “I’d certainly like to see it available to the public before I retire.” Harlow has been with the museum for 40 years. Credits: Facebook/American Museum of Natural History; Illustration via the New York Academy of Sciences Transactions 5 (1886). An $8 amateur diamond mining adventure could turn into a $1 million bonanza for Coloradan Bobbie Oskarson. 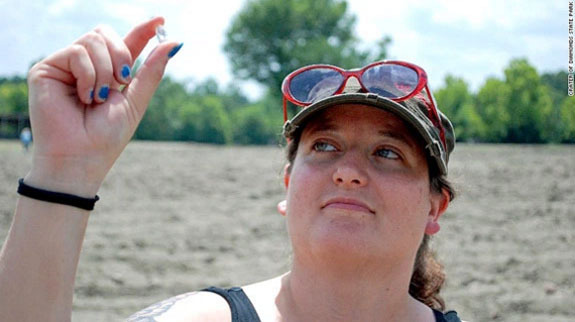 When Oskarson plucked an odd-shaped pebble from the dirt at Arkansas’ Crater of Diamonds State Park she could have never imagined that the stone might make international headlines, have its own Facebook page and sell eight months later for as much as $1 million. 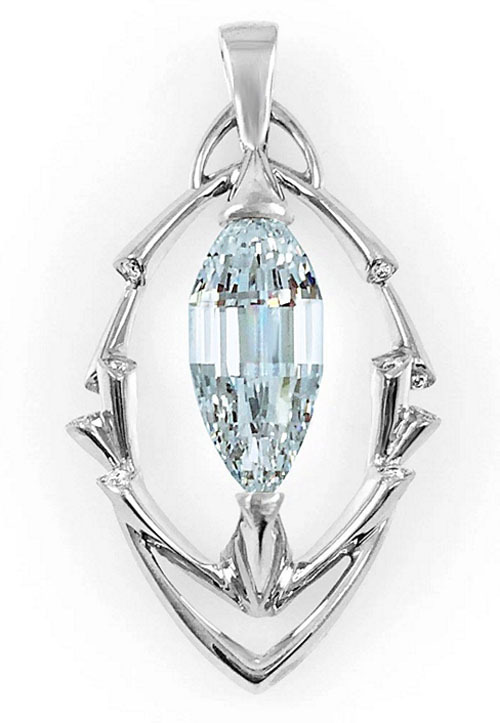 Originally 8.52 carats in weight and the shape of an icicle, “Esperanza” was transformed by Master Diamond Cutter Mike Botha into a unique 4.65-carat teardrop “triolette.” It possesses the highest possible grades for color (D) and clarity (IF – Internally Flawless). Today, the Esperanza (which means hope in Spanish) is billed as the most valuable diamond ever discovered in the U.S.
Botha’s 147-facet triolette is a shape of his own design. It resembles a teardrop and merges the elements of both emerald and trapezoid shapes. The diamond boasts 842 followers on Facebook. Esperanza is set vertically in a stylish platinum pendant designed by Ian Douglas of The Inspired Collection, Wellington, New Zealand. The pendant is accented with 10 Canadian-sourced Sirius Star® diamonds and hangs from a diamond-adorned platinum chain. After special appearances at jewelry stores in North Little Rock, Ark., Newport Beach, Calif., Phoenix, Houston and Jacksonville, Fla., the gem will be sold during an open bidding process that's set to end on February 15. The lucky winner will own a scintillating piece of Americana perfectly timed for gifting on President's Day. Bids will be accepted in person at the Black, Starr & Frost retail locations in Newport Beach and Phoenix. Out-of-town bidders are encouraged to make inquiries to vice president/managing director Adam Graham at this email address: adam@blackstarrfrost.com. Gem experts have had a hard time placing a value on Esperanza because there is nothing like it. It's a truly unique American treasure. While it's the fifth-largest diamond ever found at Crater of Diamonds, it is, by far, the most perfect in terms of color and clarity. It also boasts a totally unique cut. The process of cutting and polishing the stone took 130 painstaking hours. Back on June 24, 2015, Oskarson of Longmont, Colo., had paid only $8 to do a bit of amateur mining at the park with her boyfriend and, within 20 minutes, came away with a gemstone that could fetch upwards of $1 million. The park offers visitors the opportunity to search in the eroded surface of the eighth-largest, diamond-bearing deposit in the world. Any diamonds or semi-precious stones found in the 37 1/2-acre plowed field are theirs to keep. As we edge toward February 15, it will be interesting to see if an Arkansan will win the bidding battle for Esperanza. Photo credits: Crater of Diamonds State Park; Stanley Jewelers. 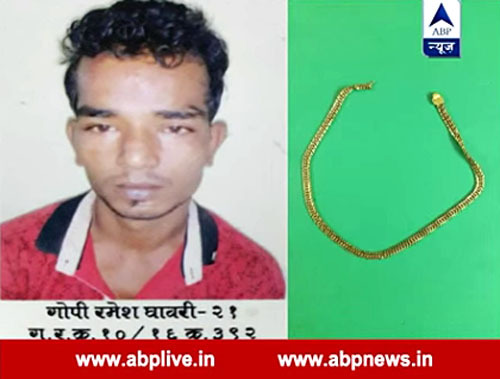 Mumbai police authorities went bananas last week to retrieve a 25-gram gold neck chain from the belly of a thief. Gopi R. Ghaware, 25, didn't know how bad his week was about to become when he decided to swipe a gold chain from the neck of a woman at a local fish market. The woman screamed, Ghaware fled, and an enraged crowd of shoppers took off after him. Within a short time, Ghaware had been tackled and roughed up by the peeved patrons. Authorities arrested the perpetrator and brought him to a local hospital for treatment of minor injuries. During the melee, the gold chain had disappeared, but a routine X-ray taken at the hospital revealed something suspicious in Ghaware's stomach. Ghaware, who had no previous criminal record, confessed to police that he had, in fact, swallowed the chain. 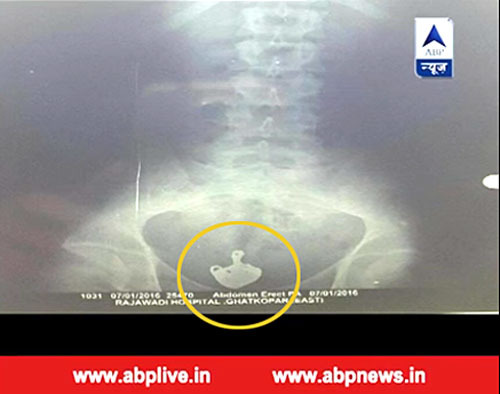 A second X-ray confirmed that the chain was still in his system, according to NDTV. This is when his nightmare went from bad to worse. On Thursday night, police authorities stood watch as they forced the suspect to consume 48 bananas — a process that lasted until the wee hours of the morning. 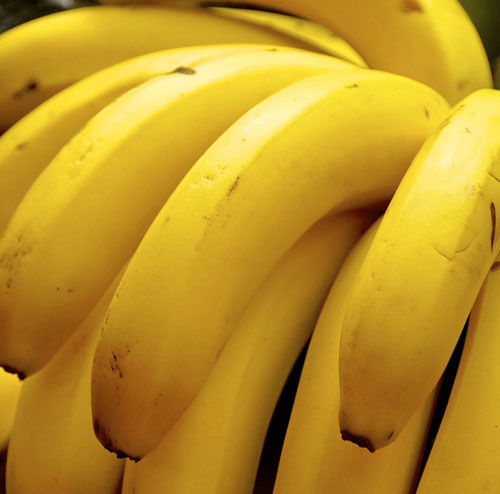 An unpeeled banana weighs approximately 4 ounces, which means that Ghaware consumed 192 ounces, or 12 pounds of bananas. In a video distributed to news agencies, the perpetrator is shown sitting cross-legged in a cell as he eats banana after banana. By early on Friday, the banana laxative had done its job and the chain successfully passed from Ghaware's system. But the humiliating saga continued when he was ordered to clean and disinfect the chain. According to UPI, the gold chain was returned to its rightful owner, who promptly brought it to a local jeweler. There, she exchanged it for a similar, pristine version. Ghaware was placed under arrest and is awaiting his day in court. Credits: ABP News/YouTube video screenshots; Banana shot via Bigstockphoto.com. 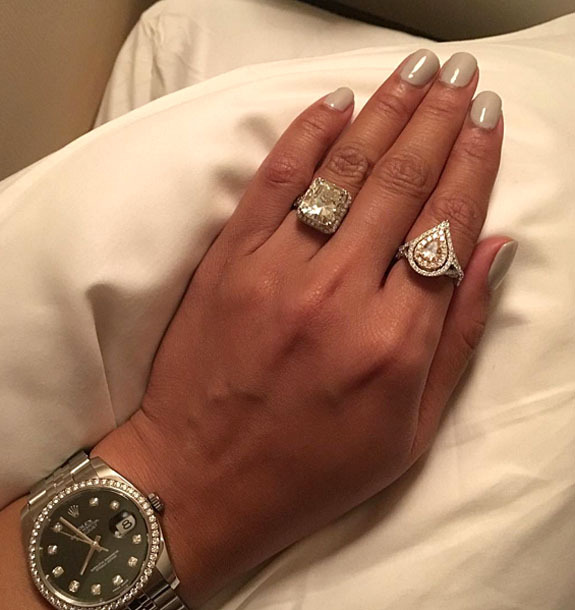 Singer and reality star Ray J proposed to girlfriend Princess Love the day after Christmas with a fabulous 8-carat cushion-cut diamond ring worth $130,000. In describing the halo-style stunner, Ray J told OK! magazine, "It's classic and fit for a princess." 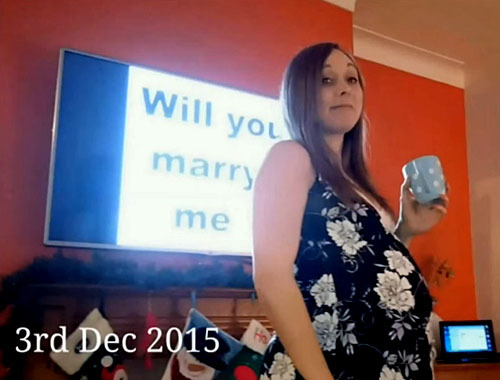 The proposal came as a complete surprise to Love. 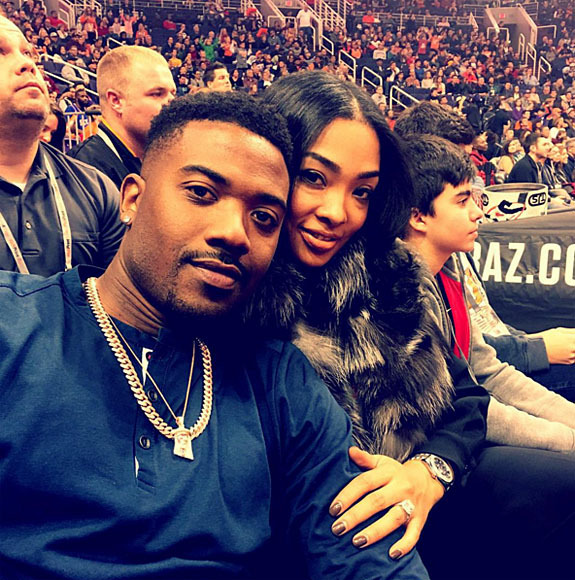 The couple had scheduled a trip to Arizona, but as they walked on the tarmac toward a private plane, Ray J got down on one knee and popped the question. To make the scene even more romantic, Ray J had invited Love's best friends and parents to hide in the plane and witness the proposal first hand. The emotional Ray J, who was born William Ray Norwood, Jr., and is the younger brother of singer Brandy, admitted that he lost his composure at the moment of truth. "I pulled out the ring, and I started crying," he told OK!. 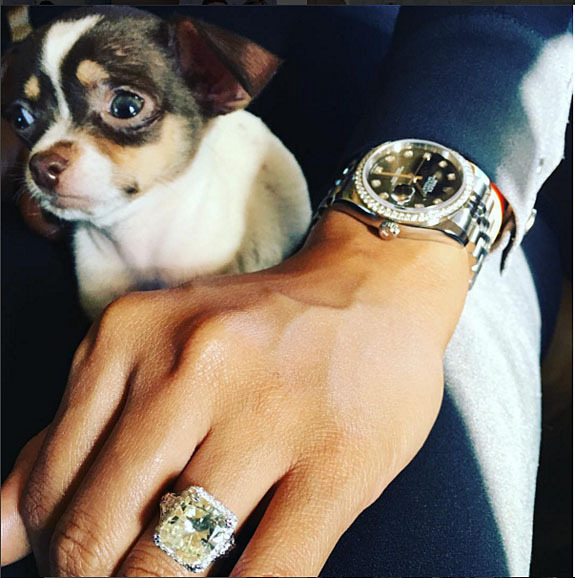 New York-based celebrity jeweler Richie Nektalov of Leon Diamonds said Ray J made his choice in an instant. "As soon as I took it out of the safe, Ray J said it was the one, that she deserved it," he told OK!. On Tuesday, both Ray J and Love were on their respective Instagram pages posting multiple shots of the ring. 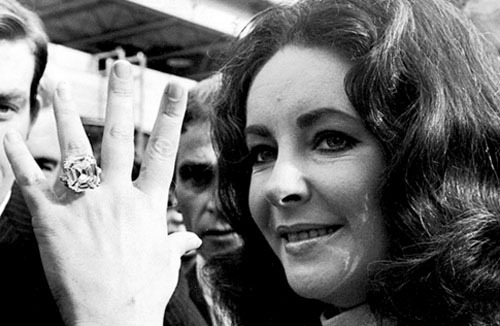 In one shot, Love is wearing two large rings, the cushion-cut engagement ring on her left ring finger and a double-halo pear-shaped diamond ring on her left index finger. OK! 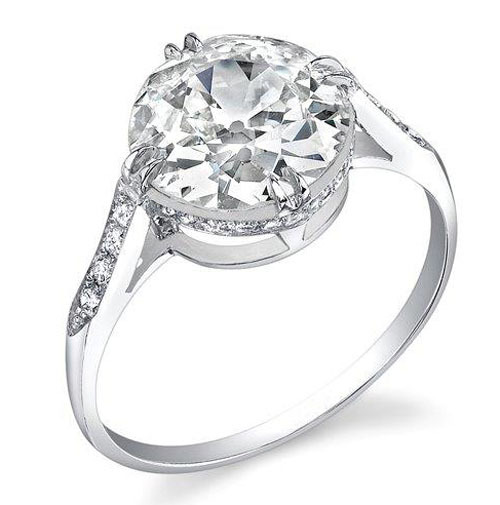 reported that the new engagement ring is a replacement for a smaller "friendship ring" Ray J had given her earlier. Might the pear-shaped diamond ring be that friendship ring? Ray J and Love have been dating for at least a year and were featured on VH1's reality show, Love & Hip Hop: Hollywood. David Bowie fans from around the world shed a collective tear on Sunday when they learned of his passing from liver cancer at the age of 69. The singer-songwriter-actor-producer leaves a legacy of timeless songs that spanned five decades. One of our favorite Bowie songs, "Golden Years," fits in perfectly with our theme for Music Friday when we regularly feature tunes with jewelry, gemstones or a precious metals in the title and lyrics. Released by Bowie as a single in 1975, "Golden Years" was reportedly inspired by the glitzy nostalgia of "On Broadway," the jazzy 1963 classic by The Drifters. Interestingly, Bowie originally offered it to Elvis Presley to perform, but when the King of Rock and Roll took a pass, Bowie decided to perform it himself. The song was featured on his 1976 Station to Station album and became an international hit, reaching #10 on the U.S. Billboard Hot 100 chart and #8 in the U.K.
Bowie's ex-wife Angela Bowie has claimed to be the subject of the song (although a counterclaim was made by former Bowie backup singer and girlfriend, Ava Cherry). Bowie implores his love interest to revel in these "golden years" — a time of untold fame and fortune. He sings, "Golden years, gold whop whop whop / Don't let me hear you say life's taking you nowhere, angel / Come get up my baby / Look at that sky, life's begun / Nights are warm and the days are young." To promote the release of the song, London-born Bowie was invited to sing "Golden Years" for a live Soul Train audience. Somewhat overwhelmed by the prospect of being on a nationally televised program in the U.S. — which included a live interview by larger-than-life host Don Cornelius — Bowie did a bit of drinking before the show to calm his nerves. The result was an uneven performance with Bowie seemingly stumbling over his own lyrics. Fortunately, he was simply lip-syncing, so the audio track remained flawless. 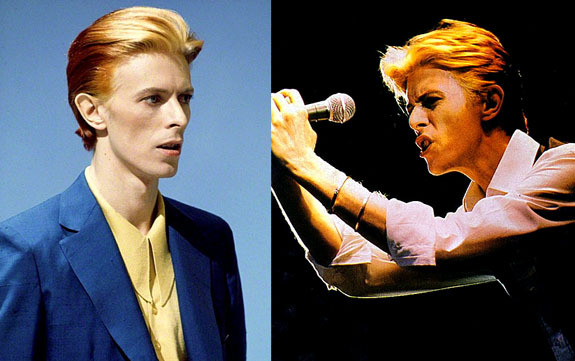 "Golden Years" became one of Bowie's signature songs and he played it regularly on his tours in 1983, 1990 and 2000. Bowie went on to have a stellar career, which included a 1996 induction into the Rock and Roll Hall of Fame. In 2004, he placed #39 on Rolling Stone's list of the 100 Greatest Rock Artists of All Time, and two years later he won the Grammy Lifetime Achievement Award. Written and performed by David Bowie. 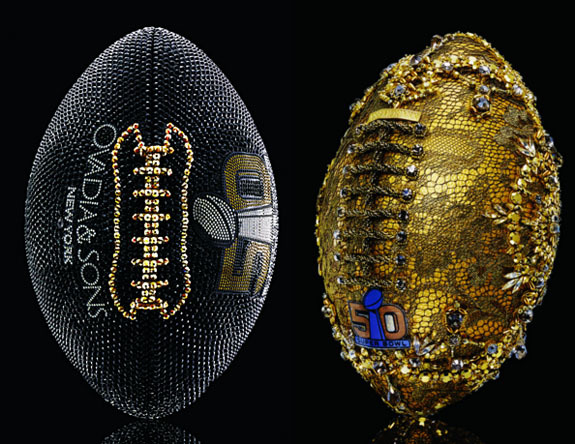 To commemorate Super Bowl 50, the NFL and members of the Council of Fashion Designers of America (CFDA) have teamed up to create 50 lavish footballs that share a "gold" theme. Rag & Bone; Tiffany & Co. 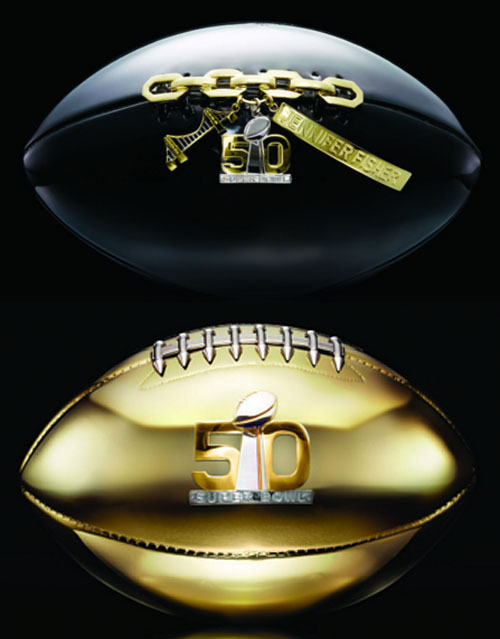 The NFL required the designers to use a "gold" element to align with the precious metal's traditional connection with 50th anniversaries. But, how they used the gold was totally up to them. While some placed gold as the central motif, others used it as a glittering accent. 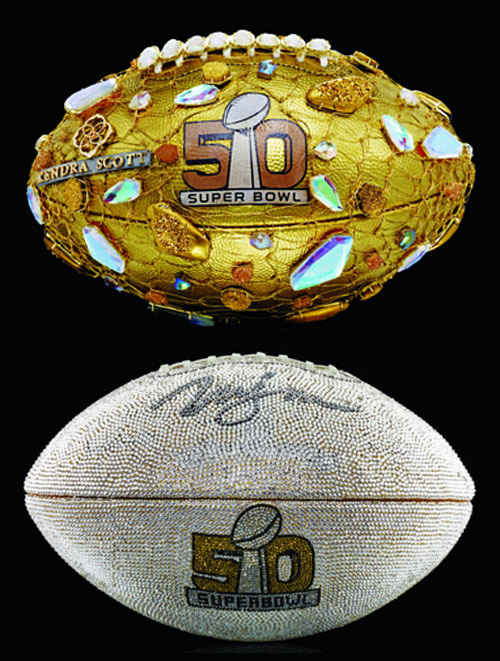 Our favorites were the designers who took it up a notch by mixing precious metals and gemstones to make their footballs into treasures suitable for a jeweler's showcase. Among the designers whose footballs evoked fine jewelry are Rag & Bone, Tiffany & Co., Ovadia & Sons, Marchesa, Prabal Gurung, Rachel Zoe, Kendra Scott, Melissa Joy Manning, Jennifer Fisher and Vita Fede. 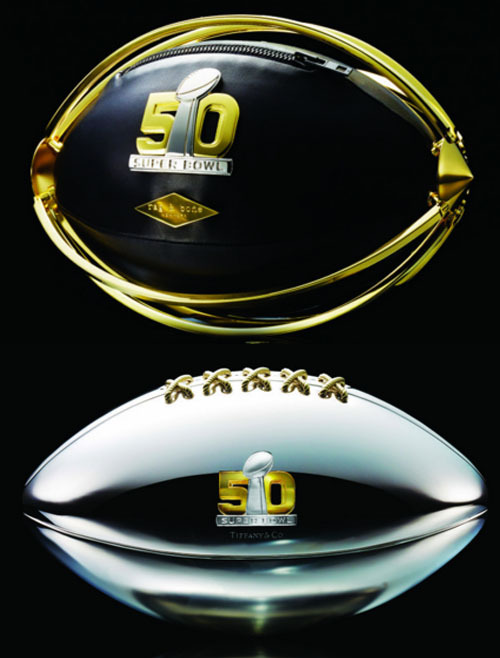 The balls will be officially unveiled at the NFL's offices in New York this Wednesday and will be making appearances at a number of promotional events in the San Francisco area leading up to Super Bowl 50 on February 7. Kendra Scott; Melissa Joy Manning. The balls are slated to be auctioned off on the NFL.com web site to benefit the NFL Foundation, the league's nonprofit organization that supports the health, safety and wellness of athletes. 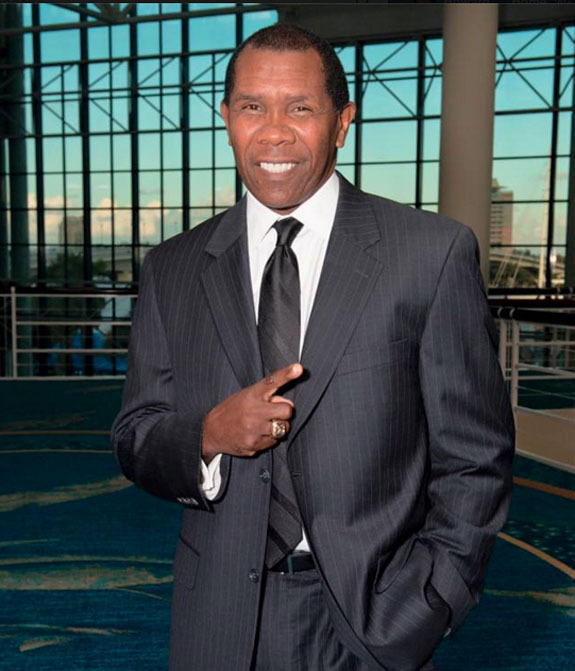 The organization finances sports-related medical research, funds the efforts of current and former players working in local communities and assists former NFL players who have come upon hard times. The auction will be held online from January 20 through February 14. This is not the first time the NFL has collaborated with the CFDA. 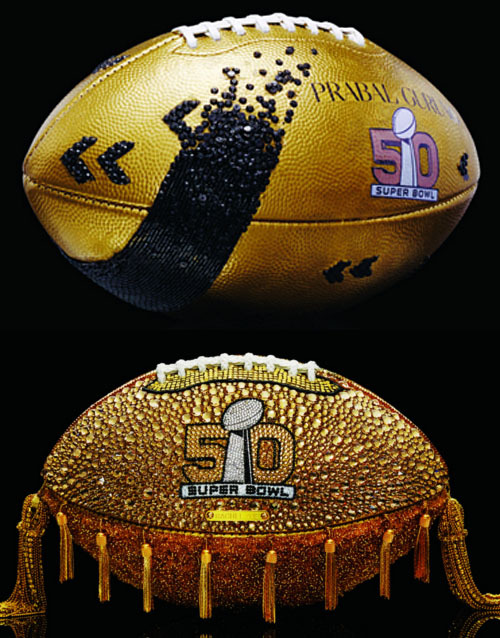 In 2014, in preparation for Super Bowl 48, an equal number of designers were challenged to create bespoke helmets that dazzled window shoppers of Bloomingdale's 59th Street flagship store in New York City and eventually were auctioned to support the NFL Foundation. Supermodel Rosie Huntington-Whiteley unveiled her flawless 5-carat Edwardian-era engagement ring from actor Jason Statham on the red carpet of the Golden Globes last week. The ring from designer Neil Lane's archival collection features a round diamond secured by its original four-prong Edwardian setting — a piece that dates back to the early 20th century, according to People StyleWatch. The platinum band is adorned with pavé diamonds on each side, and has a delicate diamond gallery that encircles the center stone. People reported that the ring's value is $350,000. The 48-year-old Statham, a Brit who is famous for his tough-guy roles in films, such as The Transporter trilogy and The Fast and the Furious franchise, was truly excited when he found the right ring, according to Lane. 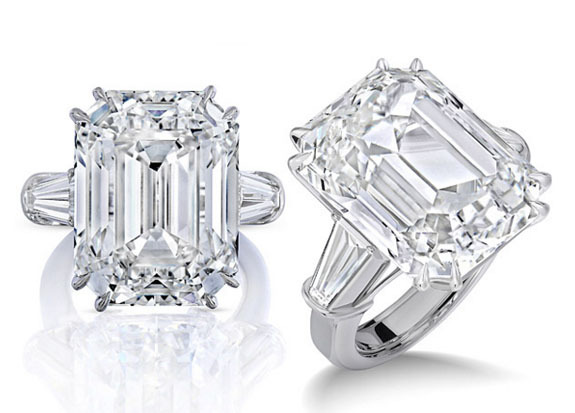 Brides.com called Statham a sweet and bona-fide genius at picking out jewelry and praised the vintage ring for its timeless, tasteful style — a flawless fit for a classic Brit beauty. Huntington-Whiteley, 28, is a top-earning fashion model and covergirl who is best known for her work as a Victoria's Secret "Angel." She is also dabbling in her future husband's profession, with a few movie roles already under her belt. The couple met on the set of Transformers in 2010 and had been dating ever since. During an April 2014 interview with Self magazine, the stunning model opened up about the love of her life. Credits: Golden Globes shots via Getty Images; Ring courtesy of Neil Lane. 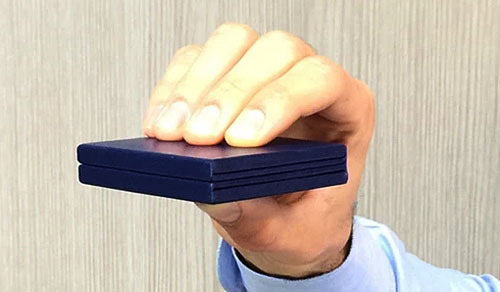 So thin that it can disappear into the pocket of your skinniest jeans, a revolutionary new engagement ring box promises to "save life's biggest moment" by keeping the ring concealed until you're ready to pop the question. 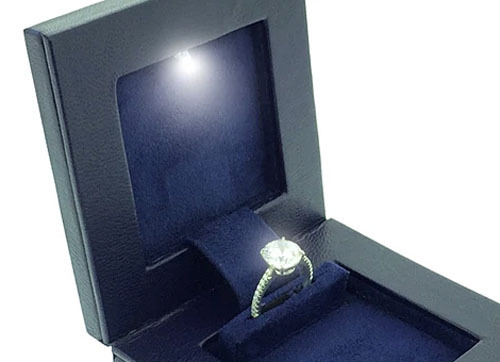 The inventors say that all too often surprise marriage proposals are ruined by a bulky traditional engagement ring box that is anything but inconspicuous. In an effort to solve this seemingly unsolvable dilemma, two New York Diamond District jewelers set out to build a better mousetrap — and the result is "Secret" by Parker Square. Approximately the size of a man's wallet and constructed with full-grain leather, the Parker Square box boasts an ingenious design that allows the ring to lie flat in the box and then propel upward when opened. "Diamonds and other gemstones sparkle by catching light and reflecting it into our eyes," explained the inventors. "To 'sparkle' there needs to be light and movement. Our ring holder raises the ring as you open the box and enhances the brilliance and scintillation of your diamond." 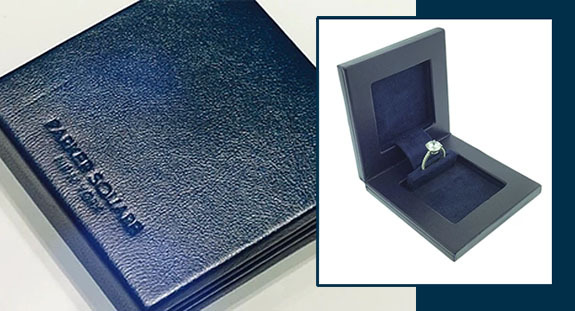 The Night Box version even has an LED light that beautifully illuminates the ring, and all versions have a frame built into the top side of the box so the groom-to-be can add a romantic photo or personal message. Both the illuminated and conventional boxes are priced at $98. The inventors are confident that consumers will pay a bit more for a premium product. "Many of the rings are breathtaking but the boxes they come in are downright disappointing," the inventors explained on Kickstarter. "They are usually ugly, bulky and made with cheap materials. We often wondered... "Why would anyone put a $10,000 ring in a $5 box?" The first run of 2,000 "Secret" boxes is set to deliver by April 2016. Credits: Parker Square images via kickstarter.com. 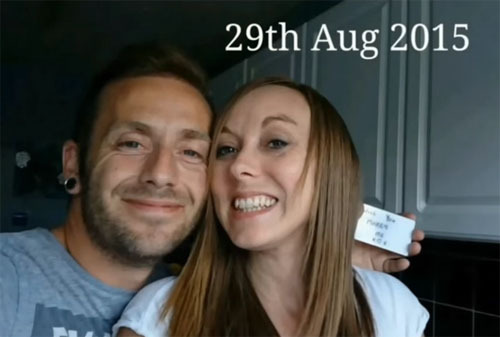 When Ray Smith learned in June that his girlfriend, Claire Bramley, was pregnant, he set in motion a five-month labor of love during which he amassed a gallery of 148 selfies, each with a secret "Will you marry me?" message somewhere in the frame. Although she's seen smiling in many of the photos, Bramley remained blissfully unaware of Smith's daily marriage proposals, which started on July 31 and ran through Christmas Day. Bradley believed Smith's daily selfie routine was meant to document her pregnancy. "He told me he was taking the pictures to create memories for the baby so I just let him get on with it," Bramley told the Mirror. 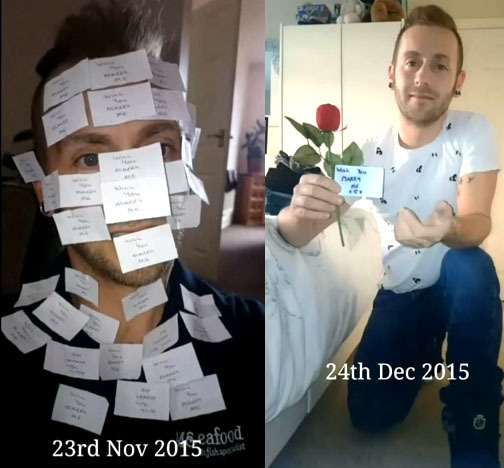 The 38-year-old fish delivery driver from Grimsby, a coastal town about 200 miles north of London, turned to the Internet to learn about the best proposal ideas. He was impressed by the flash mobs, but decided on something much more personal. "I have been planning to propose for a while and I knew I wanted to do something romantic," he told the Mirror, "so I originally thought about popping the question in a hot air balloon." The high-flying idea was tabled after he learned the exciting news that Bramley, a 33-year-old teacher, was expecting. That's when he came up with an original idea to take a picture every day for five months. In some photos, the proposal is subtly tucked in Smith's hand, while in other shots it's stuck to his forehead or lit up on a large-screen TV. To maintain the ruse, Smith often took multiple shots, one with the proposal in view and a second without, just in case she wanted to see the shot. By Christmas Day, Smith had edited his daily work into a four-minute video and he was ready to propose for real. He invited Bramley to view something very special on his laptop computer. 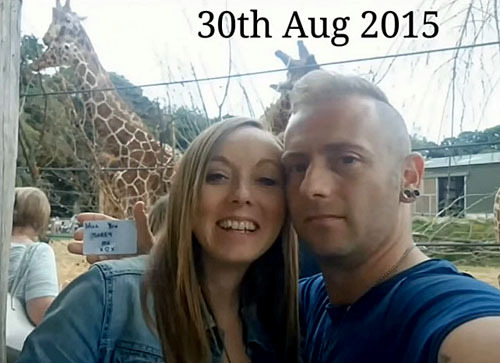 Set to the music of Ryan Huston, the video starts with a title frame that states, "I love you Claire Bramley and I love every second with you." The captions go on to explain that every day since July 31 he's been wondering how, where and when he should ask her the most important question in the world. And that question is... Will you marry me? Of course, that special phrase is communicated in the video by 148 selfies, each in chronological order. He ends the presentation with this request: "I love you and would like to ask if you could end a perfect year. And join me in 2016 planning our wedding together, Claire. Will you marry me?" "I said yes straight away," she told the Mirror. "I didn't need to think about it. I got a bit emotional, but I am pregnant after all." 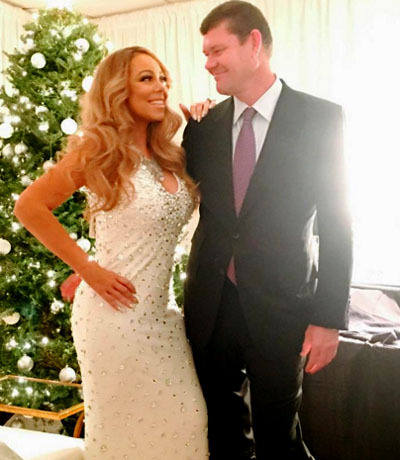 The couple is preparing for a spring 2017 wedding. Welcome to Music Friday when we bring you great tunes with jewelry, gemstones or precious metals in the title or lyrics. Country star Jana Kramer admits that she "started bawling" when she heard today's featured song, "I Got the Boy," for the first time. A song about seeing a high school boyfriend grow into the man that you never thought he could be, "I Got the Boy" struck a personal chord with Kramer, who has always wanted to pen a song about her high school sweetheart but could never get it on paper. Fortunately, the writing team of Connie Harrington, Tim Nichols and Jamie Lynn Spears (Britney's sister) nailed her sentiments perfectly, using jewelry to represent the difference between young love and a mature relationship. Kramer sings, "I got the first kiss and she'll get the last / She's got the future and I got the past / I got the class ring, she got the diamond and wedding band / I got the boy and she got the man." Kramer was introduced to the song by her producer, Scott Hendricks. "I started bawling," she told Billboard. "That's the story. Those are the words that I couldn't write. It was 100 percent true. I'm very fortunate that the song came about. It's my life." Released in 2015, "I Got the Boy" is the second single from her second studio album, Thirty One. The song was certified Gold, selling a half-million copies, and ascended to #5 on Billboard Hot Country Songs chart and #56 on U.S. Billboard Hot 100. Kramer told Billboard that the song has resonated with her fan base, even the men who see it from the opposite perspective. "On my Twitter, people are saying things like, 'I got the girl, not the woman.' It goes both ways, for sure," she noted. Born Jana Rae Kramer in Rochester Hills, Mich., the multi-talented singer also has an impressive resume of acting credits, including a four-year run as Alex Dupre on The WB television series One Tree Hill. She began her music career in 2012 with the release of her single "Why Ya Wanna." She met Washington Redskins tight end Mike Caussin on Twitter and they became engaged on her 31st birthday in December 2014. The couple tied the knot in May of 2015. Kramer admitted to Billboard that it stung a bit when she learned that her high school boyfriend was married with two children. "But I've got someone else's 'boy' now," she said, "so all's well that ends well." Written by Connie Harrington, Tim Nichols and Jamie Lynn Spears. Performed by Jana Kramer. If things were different and I had a choice, which would I choose? Credits: Jewelry shot courtesy of Wilfredo Rosado; Instagram/MariahCarey; Elizabeth Taylor uncredited. Over the years, we've written many stories about precious keepsakes that have been lost, and then found. Often, these seemingly miraculous finds were made possible by the members of The Ring Finders Directory, a group of metal-detector enthusiasts that collectively boasts 2,245 recoveries worth more than $4.3 million since 2009. 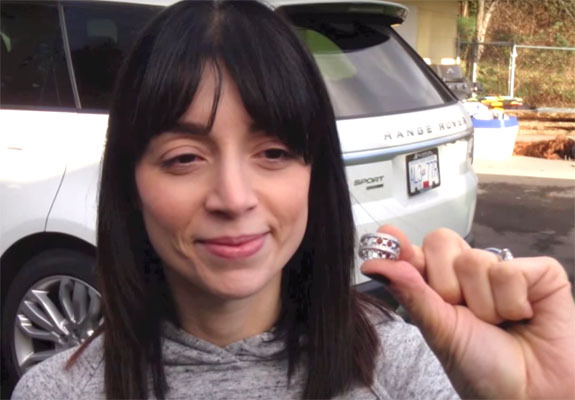 Dedicated to recovering fine jewelry at little or no charge, The Ring Finders Directory has members in 22 countries, with the bulk of participants in the U.S. and Canada. The Ring Finders website lists 269 members covering 399 cities in the U.S. and 34 finders covering 49 cities in Canada. Members work on a reward basis and ask only for a guarantee of gas money. The group got a big boost when The New Yorker magazine profiled a Ring Finders member for its January 21 online edition. 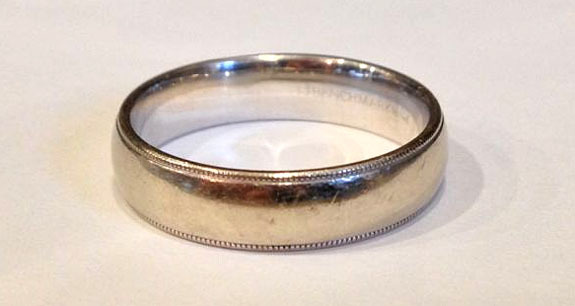 Writer Tyler J. Kelley traveled with metal-detector enthusiast Keith Willie on his mission to recover a platinum wedding ring that was lost by a Connecticut homeowner. The man, Jim Flynn, had been in his backyard stuffing hay into a black trash bag when he could sense something didn't feel right. 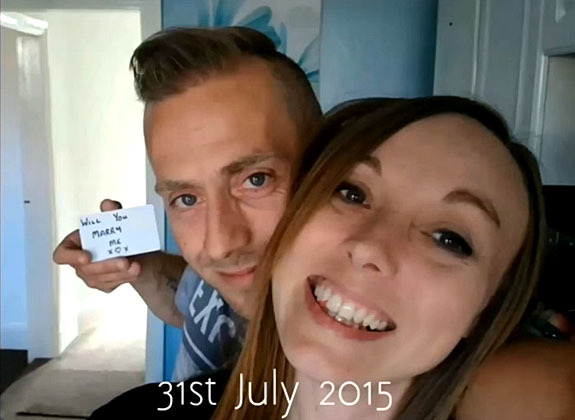 His wedding band was gone and his four-year wedding anniversary was only days away. Flynn, his wife and their toddler searched the area on their hands and knees to find the ring. When that strategy failed, Flynn decided to call a local member of The Ring Finders. Armed with a heavy-duty spade, an XP Deus metal detector and a White's Bullseye II pin-pointer, the 28-year-old Willie searched the yard, walking back and forth in straight lines while swinging the detector in overlapping arcs. Even though the newly sodded area had been wild with trees only months before, Willie started to get some hits on the detector. First, he found a scrap of metal, then a pull-tab from a soda can, a bottle cap, a smashed bullet, an antique shotgun shell, a 1957 penny and a 1946 dime. After three hours of trying, Willie could find no ring. “If I don’t find it, it’s because it’s not there,” Wille told the reporter. While Willie came up empty, Ring Finders founder Chris Turner reported a network-wide success rate of about 80%. He said the bulk of requests are for assistance in recovering rings, keys and cell phones. Objects have been pulled from parks, lakes, beaches, yards and snowdrifts. Turner noted he's been helping people find their valuables for the past 21 years. He created Ring Finders to share his passion and widen the coverage internationally. 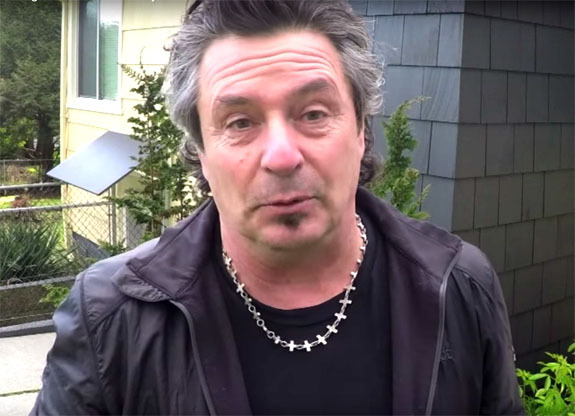 "Since I can't be everywhere with my metal detector, I'm hoping to have other metal detector specialists that enjoy metal detecting and helping others as much as I do, help people in their town or city," he wrote. The people of Botswana have been honored with the task of officially naming the mammoth 1,111-carat diamond that was discovered in their country at the Karowe Mine back in November. The citizen who dreams up the best name will win a cash prize of 25,000 pula (about $2,150). Slightly smaller than a tennis ball and weighing nearly a half-pound, the Type IIa chemically pure gem is the world's second-largest diamond. Only the 3,106-carat Cullinan, found in South Africa in 1905, was larger. 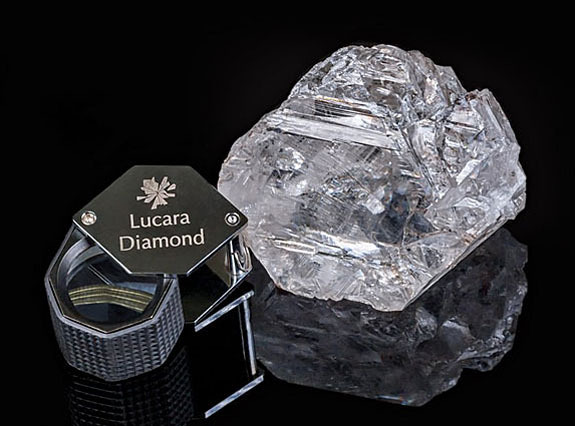 Mining company Lucara Diamond Corp. will hand out the cash prize to the Botswana citizen who comes up with the best name for the epic stone. The 11-day competition, which was open only to Botswana citizens, ends on January 28. Entrants are required to propose a name and the reasons why the name should be considered. Lucara CEO William Lamb credited Kitso Mokaila, Botswana's minister of minerals, energy and water resources, for coming up with the idea to honor his people with the naming rights. "The minister thought it would be a great idea to give [the Botswana people] an opportunity to name the stone as it belonged to them,” Lamb told Botswana's MmegiOnline. Lamb revealed that this is not the first time the Botswana people have been called on to assist with a naming task. When Lucara wanted a better name for its AK6 mine, it established a competition among the country's school children. Karowe was picked as the winning entry and the children's school earned computers for the kids' creative input. How much the 1,111-carat diamond could be worth is the subject of wild speculation. 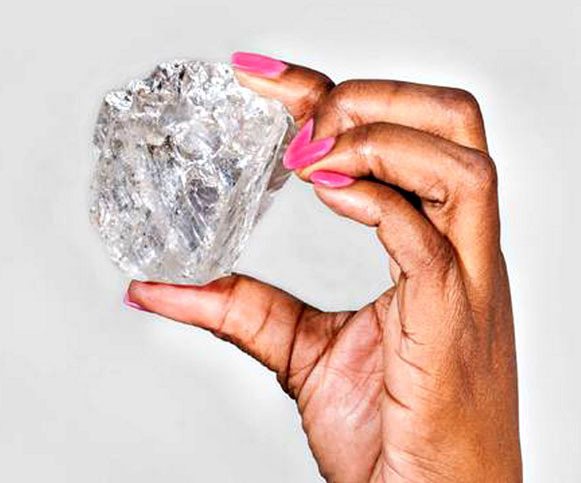 Recently, the Karowe Mine yielded a 342-carat diamond that sold for $20.55 million, or $60,089 per carat. If the soon-to-be named diamond sells for the same amount per carat, its price would be close to $66 million. The intangible factor is the gem's status of being the second-largest diamond in history — a factor which should boost its value even more. More than 3,000 years before the trade group Jewelers of America defined the modern list of birthstones in 1912, the biblical Aaron (older brother of Moses) wore a bedazzled breastplate adorned with gemstones representing the 12 tribes of Israel. The gems were arranged in four rows and set in gold. 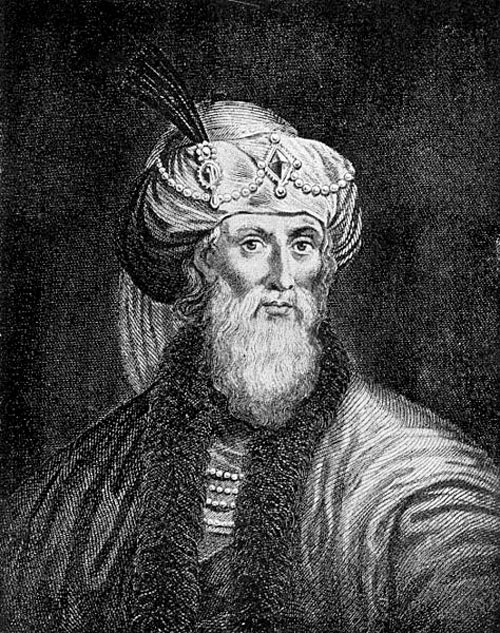 First-century Jewish historian Josephus described Aaron's breastplate in his book entitled, Antiquities of the Jews. In the following passage the gems are listed right to left. 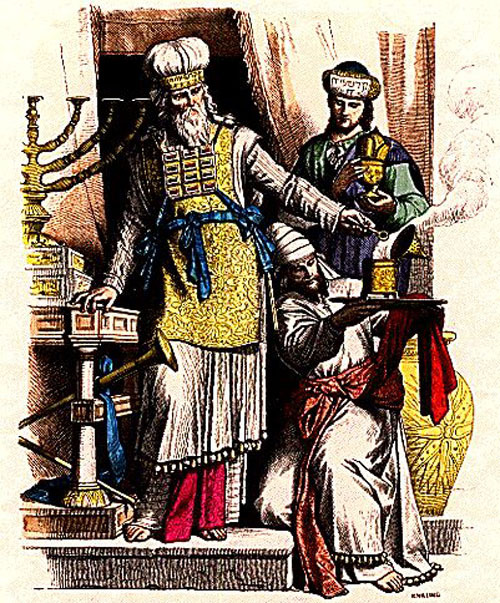 According to The Book of Exodus, Aaron, the first high priest of the Hebrews, bore the responsibility of memorializing the names of the 12 tribes before the Lord, upon his two shoulders. His ceremonial costume consisted of a linen tunic spun with gold threads and a floor-length tasseled robe. 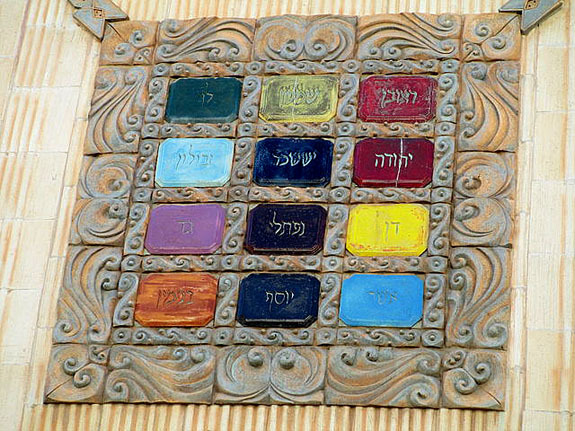 On the breastplate were precious stones inscribed with the names of the 12 tribes. The breastplate was attached to the ephod (a sleeveless garment) by gold chains/cords tied to the gold rings on the ephod's shoulder straps, and by blue ribbons tied to the gold rings at the lower parts of the ephod. "And Aaron shall bear the names of the Children of Israel in the breastplate of judgment upon his heart, when he goeth in unto the Holy Place." -- EXODUS xxviii.12,29. "The first row was a row of ruby, topaz, and emerald; and the second row, a turquoise, a sapphire and a diamond; and the third row, a jacinth, an agate, and an amethyst; and the fourth row, a beryl, an onyx, and a jasper." Aaron's priestly dress also contained a small pocket for "urim and thummim," mysterious and still undefined substances or articles that would help the priest determine God's will. Some biblical scholars believe that "urim and thummim" might have been two sticks or stones, one white and the other black, that would give a yes or no answer to a specific question. Credits: Images via Wikimedia Commons.